SilverStone® creates cookware with trailblazing design for your kitchen chemistry lab. The CXi model uses only top-quality materials with you in mind including excellence in workmanship. All cookware is PTFE-PFOA, lead- and cadmium-free having no toxins. SilverStone® uses BPA-free plastics for cooks not wanting these toxins for healthy living. 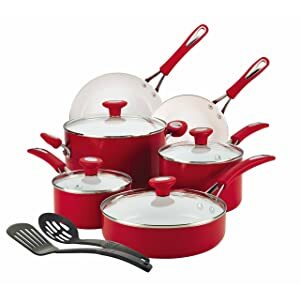 Performance and Features – The marine blue, chili red, or mango yellow sets include a 1.5-quart covered saucepan, 3-quart covered saucepan, 6-quart covered stockpot, 8-inch diameter skillet with CushionSmart™ Technology, a 10-inch diameter skillet with CushionSmart™ Technology, a 3-quart covered sauté pan, a nylon slotted turner and slotted spoon. The flat bottoms can be used on a glass ceramic cooktop as well as gas and electric stoves. Never leave cookware on a hot surface when finished cooking because the residual heat will distort and warp the pans and skillets. The handles are easy to grasp and are double riveted (no screws) made of a rubberized material. For holding in heat and moisture, the lids are made of tempered glass that you can see through with knob-type handles that do not get hot. You will be able to use the skillet in the oven up to 350 degrees F.
Your kitchen will look great in the cheerful colors and bright white permitting your food to cook evenly with no hot spots with the aluminum core, and food will glide from the pans. The skillets and cookware are dishwasher safe, but easy to clean by hand and recommended by the manufacturer. Do not use Pam or other nonstick aerosol oil cooking sprays. Use only on low to medium heat with nylon, silicone, wood, or bamboo utensils. Metal will scratch the coating. Do not cut food in the pans or use mixers and beaters. Gift-wrapping is available and the products come with instructions, a User’s Manual and a Limited-Lifetime Warranty.